Over the past month, the Swoogo team interviewed some of the best corporate event marketers on how they use LinkedIn to promote their events online. 98% of all participants agree that LinkedIn personal status updates & LinkedIn videos are the most effective channels for promoting and growing their events. Even more interesting? Organic content way outperformed paid ads. In this part of our Event Marketing on LinkedIn Blog Series, we focus on hot tips for better content writing— the sizzling kind that gets tons of engagement. Mwuahahahahah! If you're a regular LinkedIn user, you might wonder why some status updates and articles get huge engagement, with thousands of likes & comments while others are getting much less or even zero. Think of that one guy who always shows up on your feed. He's sharing insightful stories, his own experiences, challenges, and successes. And he keeps popping up for a reason— he's getting a ton of engagement on all his posts. Then there's you, sharing your company's recent blog post with a quick "we recently wrote about this" caption. And let's face it; your engagement is pretty much limited to your own colleagues. Let's take a deeper dive into this. You can't expect to show up by sharing a link once a month, even if you're just trying to post a one-time call to action. "Register to our event, only a few spots left"
"Check out the recent blog post we just wrote." It's spammy, it's promotional, and ultimately, only a few people will engage with these types of posts. Content comes first and quality content wins. But what does "quality" content mean exactly? LinkedIn, just like any other social network, wants its community to be active and to be spending as much time on the platform as possible. How do people stay as long as possible? By consuming content and interacting with others. Don't get us wrong, we hate math too— but this is an easy formula. When you post a new status update to your LinkedIn feed, the platform wants to make sure it's share-worthy so that it sticks and keeps people on the site for longer. If you were Jeff Weiner himself, you wouldn't want to show spam content to your community, would you? Step 1. LinkedIn determines the type of your post. Step 2. LinkedIn will show your post to just a small percentage of your audience. This is a way for the platform to 'test' how engaging your post really is. It would be risky if LinkedIn immediately shared it with your entire network, because there's still a risk that it might be not as high of a quality post as determined in step 1. Step 3. Your reach is determined by the number of likes, comments, and shares you're getting within a small test audience. Simply put, if someone likes your post you get 1 point, if someone comments on your post, you get 2 points, and if someone shares your post, you get 3 points. The more points you score, the more likely it is that your reach increases. A quality score from LinkedIn determines the value of your post and, ultimately, its reach. Want to dig even deeper? Here's a blog post from the LinkedIn Engineering team giving you a look behind the AI that powers the LinkedIn Feed. Now you know what to avoid— here's what to write about instead. Let's keep this between you and I, okay? Your content doesn't always have to be about your business or your event. The LinkedIn community gets excited about actionable & insightful tips that help them succeed in their career, job, and personal lives. LinkedIn members want to build real genuine relationships with other members, and having created a connection doesn't mean you get a free pass to spam them. Let's say you're passionate about Crossfit. Do you remember when you first joined a session and everyone was using heavy barbells while you were there using plastic PVC pipes because you weren't strong enough yet? Take that story and relate it to your job when you first started as an Event Manager. How have you evolved over then, what have you learned, what can you share with other professionals in your network that might be of value? It may seem like a tenuous connection between Crossfit and an event planning career, but that's kind of the point: your posts will be richer if you're drawing on the things you're most passionate about. Stories, videos, images, challenges and how you've overcome them. Insightful & actionable tips that are practical are great nutrients for great food..uhh..posts. What speaker was the most exciting one, which one are you looking forward to hearing the most, what motivates you professionally and individually? It doesn't always have to be business talk. LinkedIn audience is much more interested in who you are as a person. Some of the most engaging posts I've written have nothing to do with event marketing, technology, or startups. They're just about me sharing a challenge and how I overcame it. And here's Ana Wolsztajn using LinkedIn Video to share her excitement about the upcoming #SaaStock18 conference. 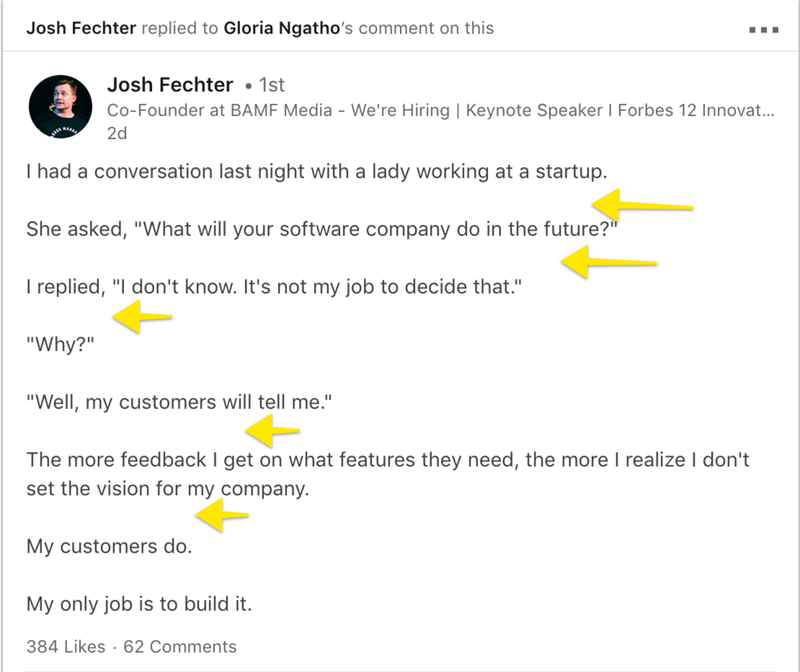 Okay, now you have an idea how the LinkedIn algorithm works, you kinda understand that all you need to do is get yourself out there and write about the topics you're most interested and excited about, it's time to look at writing rules. Keep it simple - Don't use complex words that no one understands. Every time someone has to think about the meaning of a word, you lose their attention. Credibility - Don't use words like "I think", "maybe", "eventually" if you want to sound trustworthy, authentic, and credible. Use concrete statements instead. Write for people that scan - That means, you should use short paragraphs, avoid corporate throat clearing (like introductions) and use headings and sub-headings that relate to your core message. Some LinkedIn content creators swear by leaving one line in between each sentence to make the text more legible on mobile devices. Studies from Nielsen & Norman group have shown that people often read in an F-Shaped pattern on the web. This means it's a good idea to spread it out, lead with your strongest points, and keep your posts short. Write for one reader you have in mind (not several) - How would you describe your message or story to one particular person. Give your reader a name, an age, and describe who she is. Write about the event you're promoting as if you were writing to your mom or friend. Avoid Acronyms - Did you know that the word CRM (often used as an abbreviation for the likes of Salesforce & Hubspot) has over 250 other definitions, which your readers can interpret as Cardiac Rhythm Management (also known as heart pacemakers) or Cockpit Resource Management (if you're dealing with airlines). If you do use acronyms, make sure to explain them to your audience. Use metaphors to bring your writing to life - People love metaphors. Metaphors make abstract concepts more tangible. Here's a beautiful example where Richard Feynman, an American Physicist, raves about the complex concept of quantum mechanics by using simple metaphors everyone can understand. Don't try to sound too smart- Often, we use terminology or fancy words to make us sound like thought-leaders or experts. We use abbreviations, technical terms, and clever language. That's fine if you're one hundred percent sure your reader will understand the terminology. (Here, it comes down, again, to selecting the right audience to connect with in the first place. Be Authentic and show your human side - if you show the real You and share something that's valuable, people will actually recognize it as such. Readers don't want to learn from machines (they have Google for that). They want to build real relations with people. It's in our DNA. If you're really brave, you can start sharing a native video on LinkedIn, but for starters, why don't you start with a text post?